Article from Auto Editors of Consumer Guide and some other sources. Go where vintage Mustangs gather today and you'll see far more of the 1965-70 and post-1978 models. Yet like some other period Detroiters, these "Clydesdales" are at last getting their due, being gathered in and preserved by those who grew up with them, fans who have the same affection for "their" Mustangs as older folks have for the Sixties cars of their youth. In short, times change and all things are relative, to use two old clichés. But these Mustangs also demonstrate how every car is a product of its particular era, shaped by prevailing social and economic forces and especially the personalities of those who design and build it. They also remind us again of the auto industry's perennial problem with lead times -- really "lag" times. Like the ill-fated Edsel, the ponies might have been a real success had they born three years earlier. the heavily stylized car's rear window was pitched only 14 degrees. Like its contemporaries, the '71 Mustang was created in the heady atmosphere of the late Sixties. U.S. car sales hit a new all-time high in 1965 -- Mustang, of course, had something to do with that -- and though the market had since cooled a bit, it remained plenty strong through late decade. Buyers were flush in a booming economy, and with each passing year they seemed to crave more size, more power, more luxury, and more gadgets. The Pontiac GTO had touched off a mania for "muscle cars" that had Detroit racing to stuff almost every model -- pony cars included -- with the largest, most potent engines possible. That's why Ford made room in the 1967 and 1968 Mustangs for a big-block 390 and 428 V-8 options. as the basis for the 1971 Mustang styling. But all too soon, the go-go good times came to a screeching halt. As Gary Witzenburg observed in his authoritative Mustang history: "The horsepower race that had been going on since the automobile was invented was just about over by the time the 1971 Mustangs were introduced on August 20th, 1970. The federal government's mushrooming mountain of safety and emissions and damageability requirements, over-reactions to legitimate concerns, had caused a massive rethinking of priorities in Detroit. Motor City was a fortress besieged by regulatory Huns. The drawbridge was up and the moat loaded with crocodiles. "There would be no more racing for Ford…and, indeed, few more suitable cars to be raced. As the country and the industry struggled to recover from a mild recession, the federal testing and the certifications and the paperwork necessary to appease the ravenous bureaucratic beast effectively ruled out, at least for the moment, any further thought of automotive excitement, performance, or fun. It was the beginning of a new Dark Age for the American automobile, and in August of 1970, everyone in Detroit knew it." refined with an eye to manufacturing cost and feasibility. Despite a glorious heyday that lasted throughout the 1960s, the pony car was losing its appeal by 1971 and the auto industry could certainly see it. Mustang sales had been sliding since 1966. The Chevrolet Camaro and Pontiac Firebird were holding up (aided by a handsome 1970 redesign) but were not gaining. American Motors' Javelin was a mild success, but no blockbuster. Neither were Plymouth's bulked-up 1970 Barracuda and its new Dodge stablemate, the aptly named Challenger, neither of which brought in the pile of orders Chrysler expected. A big reason was that a new wave of economy imports had caught America's fancy, including some fast-improving Japanese cars wearing unfamiliar names like Toyota and Datsun. The threat seemed minimal, and most people still couldn't conceive that the world might run short of oil some day. But Detroit evidently remembered the European small-car invasion of the 1950s, because this time it counterattacked right away. Besides mustering new compacts like the Ford Maverick, Chevy Nova, and AMC Hornet, the industry spent vast sums to bring out even smaller, cheaper subcompacts led by the Ford Pinto, Chevrolet Vega, and AMC Gremlin. By 1971, pony cars were fast losing sales to these and other sensible wheels -- down to almost half of where they'd been at their 1967 peak. The changing market also presented a stark reality unique to Ford: "Total Performance" was no longer that important to sales. Besides, Ford had little left to prove in competition after dominating stock-car and drag racing for much of the Sixties, not to mention winning the prestigious LeMans 24 Hours four times in as many years. 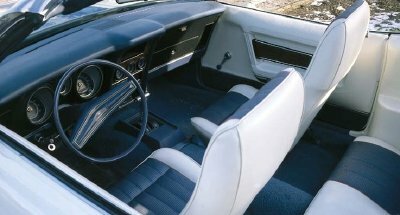 Ford emphasized styling for the early 1970s Mustangs. "You see, selling cars is not really a very profitable enterprise. It's what you sell with the car that makes the whole venture worthwhile. If you can take, say, a $2500 Plain Jane Mustang and talk the buyer into loading it up…[then] you've got a sale. In that $1000 worth of options is…the profit. That's why the original six-cylinder Mustang sat at the back of the showroom while the salesmen pushed the optional V-8…. The escalation derby gathered momentum as time went on, until by the late Sixties you could buy…engines that originally had been developed for the 200-mph straightaways of Daytona. And the prices of these overbuilt pony cars rose pretty well out of sight, too -- in the $5000 bracket rubbing elbows with Buicks and T-Birds. Option overkill." Answering a rhetorical "where will it all end?" MT made a remarkably accurate prediction: "We figure the pony cars will all fade out into the sunset by 1975…. Oh, at least one automaker might keep his pony car nameplate alive…as a sort of nostalgic reminder of When Things Were Good. But there are all sorts of tides running against the pony car now...."
Sure enough, most of the Mustang's imitators were either killed off or turned into something else by mid-decade, leaving only Ford, Chevrolet, and Pontiac to carry the torch -- and some would judge the coming Mustang II as anything but a traditional pony. Just as important as the late-Sixties zeitgeist in shaping the 1971 Ford Mustang were the personalities of short-time Ford president Bunkie Knudsen and designer Larry Shinoda, the GM guys who shocked the industry by jumping ship in 1968. Both loved hot cars, but while the expansive fourth-generation certainly reflected that, it was also something of an ego trip. Knudsen went to Ford after being passed over as GM president, a key reason he accepted the Dearborn job from chairman Henry Ford II. It's therefore reasonable to assume that Knudsen was determined to show by his labors at Ford that GM had made the wrong choice. Also, like his new Dearborn rival, Lee Iacocca, Knudsen knew a thing or two about automobiles and how to sell them. He was arguably even more a "car guy" than the jilted Iacocca, though Shinoda shaded them both. In any case, Knudsen wasted little time in looking over Ford's near-term product plans, especially those involving icon models like Mustang. The key thing is, he did so with full knowledge of what General Motors was planning for those same future years. Knudsen's management skills were beyond doubt -- after all, he'd come to Ford after doing a bang-up job as general manager at Chevrolet -- but his insider knowledge of GM's plans gave Ford a golden opportunity to outdo its crosstown foe. are evident on this 1968 prototype. V každém případě, Kundsen se zabýval tržními plány Fordu, včetně těch které zahrnovaly ikonu jménem Mustang. Důležité je, že byl obeznámen s plány svého někdejšího zaměstnavatele GM. O jeho manažerských schopnostech nebylo pochyb. Přišel do Fordu po bezpochyby úspěšné funkci generálního manažera Chevroletu, což dávalo Fordu jedinečnou možnost překonat svého největšího rivala. To byla samozřejmě jedna z výhod, které podpořila nabídku prezidentského postu od Henryho Forda místo Iacoccy . Na outsidera měl Knudsen překvapivě velký vliv. but the crosshair grille was rejected. A final factor in shaping the '71 Mustang was Ford's vaunted marketing department, ever a powerful influence on company decision-makers. After analyzing sales trends, customer comments, intelligence reports, and other piles of data, product planners concluded the next Mustang, to use Mustang historian Gary Witzenburg's words, "would have to be bigger…longer wheebase, wider treads, beefier chassis, suspension, driveline, and brakes, and larger wheel openings to take the bigger tires. At the same time, it would have to be quieter, roomier, more comfortable, [softer-riding], and more luxurious to satisfy the other end of the market. Of the so-called 'three faces of Mustang,' the profits were clearly generated by the luxury face as much as the macho face, and the expectations of small luxo-car buyers were also increasing every year." model, but the wheel design would be preserved for optional wheel covers. "You [always] run into the problem…of how to make the car all things to all people, and I think that over time, the greatest fights we had with the Mustang were to keep the compromise package. The product planner's idea of how to increase the sales volume of a car is to make it accommodate more people and to add creature comforts. But the minute you begin to fool with compromises in that sort of package, guess what? You end up with a two-door sedan. And then they wouldn't understand why it didn't look quite the same, and you have to explain that you...can't make [one car] serve two masters." Through it all, there were plenty of false starts on the design of the next model. There was intense debate within the corporate ranks about the design direction for the 1971 Ford Mustang. One camp favored a continuation of Mustang's sporty personality. Another argued for greater size and more luxury appointments. Design executive Gale Halderman and his Ford Studio designers tried to satisfy both sides. were informed by insider knowledge of GM's product line. They began work around May 1967, just as the '69 Mustang was wrapping up. Once more, they immediately thought big. "The first clays looked monstrous," Mustang historian Gary Witzenburg notes. "And they were ugly!" Though the long-hood/short-deck profile remained a given, most workouts through the fall of '67 were visually massive and awkward, with puffy lower-body contours, high beltlines, thick rear roof quarters, pouty Thunderbird-like noses with massive bumper/grilles, and willy-nilly sculptures and humps. Evidently, designers still felt management wanted some T-Bird "influence" in the Mustang, but they now tried to marry that with "performance" cues like Shelby-style scoops and pop-open gas caps. For all the false starts and misdirection, several early ideas would survive to the showroom, such as a simple, straight character line high on the body sides and, for the hardtop, a "flying buttress" rear roofline with upright "tunneled" backlight, perhaps prompted by intelligence on '68 Dodge Charger styling. that Bunkie Knudsen approved for 1971.
crisp creases had replaced flabby designs. Fortunately, designers stripped away most of the flab by autumn, opting for crisp creases, swoopy fender shapes, and kicked-up "ducktails." More protruding fronts were tried, but also flat faces, and trapezoidal nose shapes were favored for a time. As usual, there were many experiments with dual, quad, and hidden headlamps, plus "floating" grilles and -- as a new signature for the fastback -- a set of vertical air slots just behind the door. For a time, the fastback was also planned for a "tunnelback" roof, with and without rear-quarter windows. By mid-January 1968, the fastback had acquired a sharp beltline kickup aft of the doors and an almost flat roofline with a near-horizontal rear window. When Knudsen came to power a few weeks later, he took one look at this fiberglass model and looked no more. As designer Gale Halderman related: "He approved that '71 right in the studio. We asked if he didn't want to take it outside…and he said, 'No, I like it right here.' We said, 'Well, there are a couple more being done, wouldn't you prefer to wait and see how they turn out?' He said, 'No, I like this one.' We had never had approvals like that before." Even so, designers worked up several alternatives in full-size drawings during April even as Knudsen's choice was being production-engineered with an eye to cost and feasibility. The car was more or less finished by mid-June, but tinkering with grille inserts, taillamps, trim, and other minor stuff continued for another year. When Carroll Shelby decided to leave the car business in 1969, management briefly considered a "Cobra" version of the '71 to replace the Shelby-Mustang. Based on the hardtop, not the fastback, it ended up looking aggressive but contrived. We might be glad it went no further. The SportRoof fastback was also among the 1971 Mustang models. The redesigned Mustangs in showrooms for 1971 reprised base and Grande hardtops, a convertible, and Sportsroof fastbacks in regular and Mach 1 trim, plus a new Boss 351 version. Stylists didn't try to hide the expanded dimensions that Ford president Bunkie Knudsen and his product planners ordained. If anything, the new look seemed to emphasize the sudden growth spurt. Though wheelbase was stretched just an inch to 109 inches, overall length tacked on 2.1 inches to 189.5. More significant was a near three-inch gain in overall width, to 74.1 inches, matched by broader front/rear tracks of 61.5/61.0 inches. Height was fractionally reduced to 50.1 inches on SportsRoofs, 50.8 on other models. Though each of these changes was hardly colossal in itself, they collectively helped fatten the '71 Mustangs by some 500-600 pounds over comparable 1970s, with the heaviest models flattening the scales at over 1.5 tons. All very different from the lithe compact Ford started with just seven years before, which author Brad Bowling pointed out was some seven inches shorter and narrower, plus a good deal lighter. 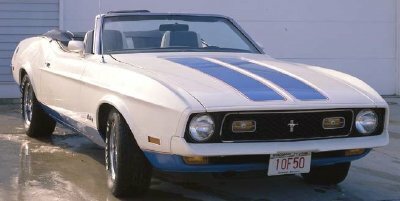 If the '71s were heavier by design, at least they were quite tasteful per Mustang tradition. All models wore a higher beltline swept up behind the door, rounded body sides relieved by a simple half-length crease line, and neatly cropped tails with the trademark triple taillamps, albeit squashed a bit and rounded at the corners. Bumpers were slim U-shaped beams snugged close to the body. Grilles were blunted and full-width, with a dual-beam headlamp at each end. Base models and the Grande capped hoods and fenders with a bright inverted-U molding curved down to meet the bumper ends as a sort of frame. Within the grille was a bright, broad rectangle bisected by a chrome horizontal bar carrying a corralled running horse -- back after a two-year absence. windshields and hoods that were extended back over the cowl. The Mach 1 and Boss 351 had their own face, with a black, honeycomb-texture grille insert, a small "pony tricolor" emblem in the middle, and flanking "sportlamps" -- amber running lights wired in with the headlamps. All models wore more steeply angled windshields, and hoods were extended back over the cowl to hide the windshield wipers, a dubious GM idea doubtless decreed by Knudsen and designer Larry Shinoda, both of whom had defected to Ford from GM with knowledge of the General's upcoming product line. Hardtops wore bulkier "buttressed" rear-roof quarters and shared a higher rear deck with convertibles. Luggage space, however, actually decreased to 8.1 cubic feet on those body styles. Exterior door handles shifted from pushbutton grips to a flush-mount pull-up style. Grande retained a standard vinyl roof covering (available in five colors), twin "racing" mirrors keyed to body paint, bright wheel-lip and rocker moldings, and body side pinstripes. Convertibles were upgraded to a standard power top with glass rear window and color-keyed boot, plus tinted windshield. and only 6121 were built. The Mach 1 borrowed another contemporary GM styling gimmick: a front bumper covered in body-color polyurethane plastic (with matching upper grille frame). Though not as "squashable" as the similar Endura-covered noses of recent Pontiacs, the plastic wrap did ward off dings while lending a purposeful look appropriate for the model. 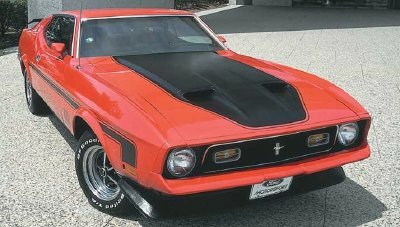 Mach 1s also carried an angled chin spoiler; domed hood; honeycomb back-panel appliqué; bold body side tape stripes in black or argent (silver); and contrasting perimeter lower-body paint, again black or argent depending on main paint color. 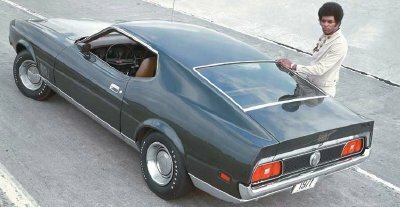 A freestanding Boss 302-type rear spoiler was available. A double-dome hood with simulated air scoops was a no-charge option. The scoops were functional when ordered with one of the top-power engines. GM cues were evident inside the new Mustang as well. Find out more about the interior and optional equipment on the next page. of the Chevy Camaro on the 1971 Mustang. but the logo, as always, was red, white, and blue. Another option was the performance-oriented Mach 1 package. The 1971 Ford Mustang Mach 1 was not what it was in 1970 guise. First, base price went up a sizable $200 to $3268, and that bought only a standard 302-cubic-inch V-8, not a 351. Worse, retuning for this year's stricter emissions standards robbed the 302 of 10 horses, leaving it at 210 horsepower on unchanged 9.0:1 compression. spoiler and hood scoops, and optional two-tone hood paint. Yes, 351s were still available for the Mach 1 and other versions of the 1971 Ford Mustang: a 240-horsepower two-barrel ($45) and a 275-horsepower four-barrel ($93). With vehicle weights up so much, the base 200-cubic-inch six was sensibly scratched, leaving the torquier 250, though it, too, lost 10 horses, dwindling to 145. At the top end of Mach 1 performance was again Mustang's big-block V-8. That engine was now a 429 -- which raised a few eyebrows -- but it wasn't the exotic semi-hemi of 1969-70. While this new Cobra Jet mill did have the same cylinder dimensions as the semi-hemi, it was essentially a short-stroke version of the Thunderbird/Lincoln 460-cubic-inch V-8, with wedge-type combustion chambers and conventional construction. The 429 began the model year in regular (CJ) and ram-air (CJ-R) versions. Both had four-barrel carburetors, hydraulic lifters, and a nominal 370 horsepower, though most observers thought the cold-air ducting put the CJ-R at 380-385 horsepower. A solid-lifter Super Cobra Jet (SCJ) arrived a few weeks later at 375 horsepower, again with or without ram-air. All 429s could be ordered with 3.91 and 4.11:1 rear axles, but the SCJ required those ratios and the optional Drag Pack with locking differential. None of these brutes was inexpensive at $372-$493, which likely explains why initial orders were so weak -- and why Ford decided to drop all three by midseason. Most probably went into Mach 1s, though they were technically available for any '71 Mustang. A rear spoiler and Magnum 500 wheels were also optional. 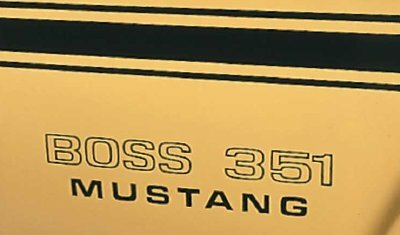 According to Mustang chief program engineer Howard Freers, the 429 with its canted-valve heads "was a much wider engine than the 428, and that's why the car got wider" -- ironic in view of the engine's short tenure. "It took a [wider track] to get those monsters in there." But engineers took advantage of that to optimize handling for all models, which was "a major problem objective," Freers recalled. "I think we [improved] it…on the base model as well as the big-engine jobs." A key decision was fitting staggered rear shocks with any 351 or 429 engine. The chassis wizards also recalibrated the base suspension to suit the bigger, heavier '71 package, revamped front-end geometry, and redesigned the steering gear. Cars with the comp suspension got variable-ratio power steering, allegedly borrowed from GM. Its chief advantage was needing fewer turns lock-to-lock, appreciated on fast, twisty roads. twist locks were standard equipment on all Mach 1s in 1971. A 429 Mach 1 was among the 1971 Mustangs that Chuck Koch tested for a January 1971 Motor Trend review. It did 6.5 seconds 0-60 mph, 13.8 at 104 in the quarter mile, topped out at nearly 114 mph and averaged just 9-10 mpg on premium gas. By comparison, Motor Trend's test 1971 Mustang 302 hardtop posted 9.9 seconds 0-60 mph and 17.5 seconds at 78 mph in the quarter-mile. Top speed was 86 mph with the standard 2.79:1 axle. Fuel economy was 15.2-17.1 mpg on regular fuel. The Boss 351 made most of the Mach 1 package standard -- and then added some options of its own. The next page tells you what this model had under the hood. 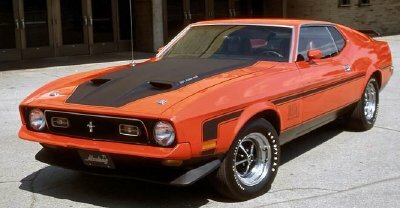 The 1971 Ford Mustang Boss 351 listed at $4101 on its belated debut at the November 1970 Detroit Auto Show. Save model badging and a chrome front bumper, it looked much like the 1971 Ford Mustang Mach 1.
was the quickest, most roadable '71 in the Mustang stable. Indeed, it could have been badged "Mach 2," as many of its standard performance goodies were available for the more affordable Mach 1. For example, though both included the stiff competition suspension, the Boss came with F60-15 tires instead of E70-14s, plus power front-disc brakes ($70 otherwise), wide-ratio four-speed gearbox with Hurst linkage, 3.91:1 Traction-Lok axle ($48), functional hood scoops, dual exhausts, heavy-duty battery and cooling system, rear spoiler, electronic rev limiter, and gauge package. 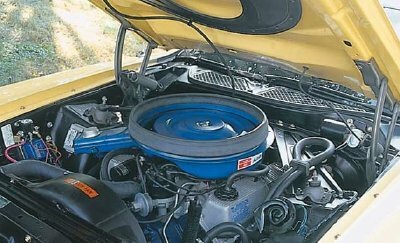 The significant difference was the Boss 351's very special engine, an exclusive High-Output (HO) 351 Cleveland with four-barrel (4V) carb, soaring 11.0:1 compression and 330 horsepower. through a four-speed manual gearbox with Hurst shifter. Touted by Dearborn as "the best all-around performer in Ford production-car history," the new Boss was the fastest of the '71 breed -- and the most roadable right out of the box. Chuck Koch, who tested a trio of Mustangs for a January 1971 Motor Trend review, clocked the Boss at 5.8 seconds 0-60 mph, with a standing quarter-mile of 13.8 seconds at 104 mph. By contrast, a 429 Mach 1 took 6.5 seconds and did the quarter in 14.5 at 96.8 mph, though it might have been hampered a bit by its Cruise-O-Matic. Car and Driver had lots of good things to say about the Boss 351 in a February 1971 road test. For starters, the "HO engine performs admirably…. It produces a generous quantity of power for its size and yet is remarkably tractable and docile." C/D explained this by waxing poetic about premium internal features like Boss 302-type "staggered valves the size of manhole covers and ports like laundry chutes. It makes the [Camaro's] Z-28 look like a gas-mileage motor.... [C]amshaft lobes lift the Boss' valves to rare heights for a street engine. In fact, only registered extremists like the L88 and aluminum-block ZL-1 Chevys have more valve lift than the Boss 351 engine." Topping it off was "a 750-cubic-feet-per-minute Autolite carburetor the size of an electric typewriter." C/D judged the variable-ratio power steering as "not particularly quick on center" but "remarkably precise -- certainly as good as the best from Detroit -- and small steering corrections can be easily and accurately made." at midseason after building only 1806. But the editors had "serious doubts about the suspension. The car just doesn't handle well enough to be worth the punishing ride. It feels like all of the suspending was done by short lengths of oak two-by-fours…. [S]tylists should share part of the blame…. They demanded a low car, which means the engineers had very little room for suspension travel. Consequently, the spring rates had to be very stiff to avoid bottoming out. The Boss has what feels like cement springs, but it still bottoms readily--a situation that deals your hind end a healthy whack." On the other hand, "it doesn't roll much and it will generate high cornering forces in situations where you can use plenty of power to keep the tail out. Without power it understeers fiercely.… [And if] the space available is really tight, [the driver] dare not apply power suddenly because the car will understeer even more. We prefer something with more nearly neutral-steer characteristics like the Firebird Trans-Am." Critics had even more unkind things to say about the overall Mustang lineup. by 1973 this optional Instrumentation Group made things a bit better. The critics were on to something, as public tastes dictated several running changes during 1971. Running changes (updates made during a model year for various reasons) would become a vexing Detroit routine in the Seventies, and the Ford Mustang saw several before closing the '71 campaign. Besides dropping big-block options, Ford fired the Boss 351 high-performance model around midseason. Sales were only 1806 to that point, evidently too few to satisfy Dearborn bean-counters. But then in April came a pretender of sorts, a "Sports Coupe" hardtop decked out like the Boss and Mach with a similar grille, twin-scoop hood, striping, and color-keyed front bumper, all for just $97 extra. "This may have sold a few cheap hardtops," Mustang historian Gary Witzenburg huffed, "but it was also one more nail in the real high-performance Mustang's coffin." Exact production is unknown, but many experts estimate 500 -- not exactly a barn burner. Another telling sign of the times appeared in May with a so-called "351 CJ" option. This was basically the HO V-8 with hydraulic instead of mechanical lifters, plus compression drastically lowered to 8.6:1 for knock-free running on the low-lead and unleaded gasoline then coming on the scene -- another response to government emissions standards. Even so, horsepower checked in at a respectable 280, channeled to a mandatory 3.50:1 rear axle through automatic or four-speed transmission. The competition suspension was a mandatory option. In retrospect, the '71 Mustang probably deserved the bad press it got, but that's only because buyers had moved on in ways that no one could have predicted in 1968. Ford showed far better timing with its compact Maverick, which rang up close to 579,000 sales in a long debut model year and nearly 272,000 more for sophomore '71. Mustang, meantime, again suffered right along with its peers, model-year sales dropping nearly 21.5 percent from 1970 to 149,678 units. 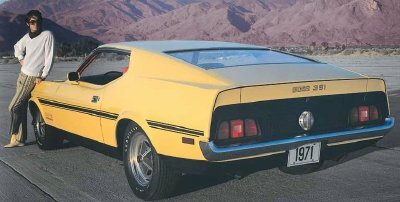 Hardtops plunged to around 83,000, the convertible sank to a bit over 6000, and fastbacks did about 60,000, of which Mach 1 accounted for a healthy 36,500. At least Ford could still truthfully advertise Mustang as the most popular car of its type, as the archrival Chevy Camaro finished a distant second with 114,630 model-year sales, though admittedly with just coupes. But Ford had little choice but to keep plugging away on the newly redesigned model. 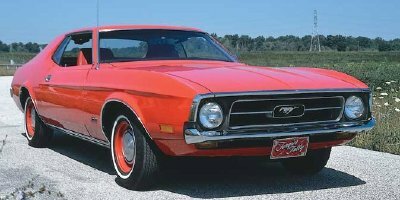 Hoping to spur lagging Mustang sales, Ford added a "Sports Coupe"
in 1971 with Boss/Mach 1 styling. There was nothing Ford could do with its yearling but keep to plugging and hope the market might swing back Mustang's way. Predictably, the 1972 Ford Mustang didn't look very different, but there were plenty of changes underneath. and standard (instead of optional) wheel-lip and rocker trim. The most discouraging alterations occurred under the hood. First, stricter emissions standards dictated reduced compression for all engines to accommodate low-calorie 91-octane fuel. Second, Ford and other automakers now switched from quoting horsepower in SAE gross measure to the more realistic SAE net method -- which had the unhappy effect of making the actual power losses look even worse on paper. With this, compression on the 250 six was dropped a full point (to 8.0:1), resulting in 95 net horsepower. A half-point drop (to 8.5:1) left the two-barrel 302 V-8 at 136 horsepower. Among 351s, the two-barrel unit claimed 168 net horsepower on looser 8.6:1 compression, while the four-barrel was down-rated from 280 to 275 horsepower (and no longer called "CJ"). Performance fans cried in their beer, but Ford made amends at midseason by reinstating an HO 351 option, albeit decompressed to 8.8:1 and 275 horsepower. As before, three-speed manual was the standard transmission for the six and two-barrel V-8s, with four-speed and Cruise-O-Matic optional. Four-speed was otherwise standard and Select-Shift automatic available -- except in California, where even stricter emissions levels mandated automatic with all V-8s. "California versions" would be another yearly burden for automakers in the Seventies. Repeal of the federal excise tax allowed Ford to trim base prices. This standard hardtop came down $182 to start at $2729. At least the HO had low enough exhaust emissions to be sold in the Golden State, "a feat many other manufacturers (Chevrolet with its 454s, for example) haven't been able to accomplish," as Car and Driver noted in March 1972. The magazine got an early drive in an HO fastback, and though the thrill factor was inevitably lower than with the short-lived Boss 351, there was still a certain magic at work. "[This car] is no Little Lord Fauntleroy out to play," C/D reported. "It's big and it's self-assured. Everything is massive. When you lean on the Hurst lever…you can feel about 10 pounds of brass synchronizer rings and steel hubs sliding into position.... There is little demand for finesse, only machismo.... The HO doesn't really feel like a high-performance engine at all. You don't have to wait for the good part of the torque curve. It's there all the time -- flat rather than peaky like the old Boss 302s." Of course, performance was down thanks to the lower compression and a less radical solid-lifter camshaft, but the '72 HO wasn't exactly sleepy, C/D reporting 6.6 seconds 0-60 mph and a standing quarter-mile of 15.1 seconds at 95.6 mph. And more go was readily available for determined hop-up artists with a Ford parts catalog. "Just change the camshaft (the adjustable rockers are already there) and raise the compression ratio back up where it belongs," C/D advised. "And if you are really serious you'll bolt on a higher-capacity intake manifold and carburetor." Best of all perhaps, this HO was available in any '72 Mustang. And it looked amazingly cheap at $119, though it required other equipment that added up to a fairly stout delivered price. Among these mandatory options were the comp suspension ($29), F60-15 tires on wide wheels ($92), power front-disc brakes, 3.91:1 rear axle with Traction-Lok ($56), and heavy-duty battery and radiator. "But you need that stuff anyway," C/D asserted. "And when you get it all you find that the 351 HO drives just like last year's Boss . It rides like a Grand National stocker [and] understeers -- plenty. Ford apparently likes its cars that way." 350 HO V-8, which would be Ford's last performance V-8 for quite a while. C/D spoke for many performance fans in summing up this Mustang: "The idea of paying more [over $4000 delivered] for a slower car is irritating, but that's the way it is in 1972. Still, the HO does have some potential. Which is more than can be said about most of the competition." Sad to say, this would be Mustang's last performance V-8 for a long while. With sales still sluggish, mid-year changes were necessary again in 1972. Changes to the 1972 Ford Mustang mainly involved revisions to trim and features. Examples include fixed rear-quarter windows on fastbacks without optional power windows, unique wheel covers for the Mustang Grande model, restyled nameplates, and standard bright wheel-lip and rocker moldings. Group available for 1972 hardtops and SportsRoofs. Prices came down a bit after Congress repealed the federal excise tax, hoping to boost car sales amidst "stagflation." Ford reduced its dealer discount at about the same time. Together, these moves saved consumers an average of $200. In February, Ford again hauled out the Sprint name for another cosmetic package -- two, actually. The basic $156 "A" option sported white paint set off by broad blue hood and decklid accents edged in red, plus star-spangled "U.S.A." shield decals on the rear fenders and a color-keyed Mach-style nose. 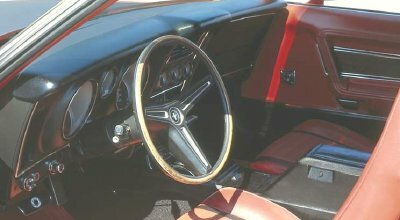 Also included were matching two-tone cloth/vinyl upholstery, color-keyed hubcaps with bright trim rings, whitewall tires, and racing mirrors. in either of the two Sprint packages. A more functional $347 "B" version added "mag-type" wheels, F60-15 white-letter tires, and the comp suspension. Either way, a Sprint was hard to miss. But author Gary Witzenburg deemed it just one more marketing ploy dealing "another heavy blow to what remained of the macho Mustang's ego" because a similar treatment was also available for "limp-wristed Pintos and Mavericks." Ostensibly, the Mustang Sprint package was available only for base hardtops and SportsRoofs. However, Ford ran off about 50 convertibles for a parade in Washington, D.C., and it's possible that a few more were built for customers who were able to sweet-talk their local dealer into placing a special order. By now, Ford's San Jose, California, and Metuchen, New Jersey, plants had switched to building the popular Pintos and Mavericks, leaving the company's big Dearborn complex as the sole home for Mustangs. 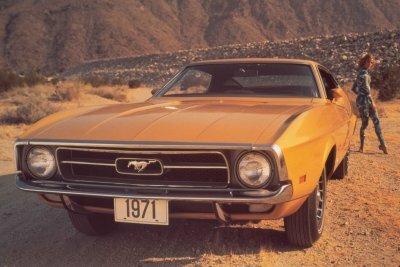 It was more evidence of the pony car's declining fortunes -- which dipped again for '72, model-year sales falling another 20 percent to just over 125,000. Only the slow-selling convertible maintained its previous level. 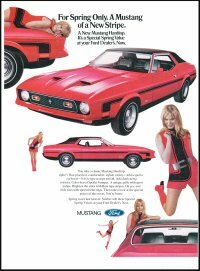 On March 6, 1972, Popular Hot Rodding magazine announced that it had chosen Mustang as "Car of the Decade." Though the award did nothing for sales and seemed rather odd on its face (who defines "the decade" as 1962-1972? ), Ford appreciated the thought. with blue cloth inserts for the seats. Rok 1973 byl posledním rokem výroby této 4. generace. Prodej se o něco navýšil na 135 000 kusu. Kabriolety si polepšily o 85 % s 11 853 prodanými kusy. Důvodem mohlo být to, že Ford oznámil ukončení výroby kabrioletu pro príští rok. Jak víme, Mustang s plátenou střechou se vrátil až v další dekádě. Yet the praise was not totally unalloyed, as the magazine's press release spoke mostly in the past tense. To wit: "The Mustang was one of the finest cars (for its price) ever to roll off a Detroit assembly line.... No single car model ever captured the public fancy as did the Mustang.... It was Mustang that broke the ice (in the pony car field) and its tremendous and continued popularity is one of the reasons [it is] 'Car of the Decade.'" Perhaps the enthusiast editors were trying to send a message. Author Witzenburg found one much later: "How ironic to have such a performance-oriented magazine heap praise on [the] car in the very year the last vestige of real performance was taken out of it." Then again, the award "did serve to point out just how strong the Mustang image remained even during the worst years of its history." You can bet Lee Iacocca knew that already. The public noticed, too, as sales rebounded somewhat in 1973. The 1973 Ford Mustang brought the pony car into the final model year of fourth generation. It was still its hefty self, but somehow it picked up some 10,000 sales, to nearly 135,000. The convertible, now the only drop top in the Ford line, soared a resounding 85 percent to 11,853 units, perhaps because Ford announced that it would not return the following year. As we know, the ragtop Mustang would be back, but not for another decade. wheels and Mach-style twin-scoop hood. The federal government now required front bumpers to sustain low-speed shunts without damage. Though Ford and other automakers met the rule with some pretty awful-looking cowcatchers, Mustang fared quite well, as body-color bumpers were now standard for all models and stuck out only a little more. The bumpers absorbed energy through an I-beam mounting bar with a box-section bracket attached to two longitudinal rubber blocks that gave way on impact, then bounced back to original position. Elsewhere, base models and the Grande got a grille insert with larger eggcrates, and parking lights on all '73s migrated from beneath the bumper to within the grille, where they were stood on end to resemble running lamps. The usual trim shuffles occurred, and Grabber colors were dropped in favor of quieter "Ember Glow" metallics. The Sprint package was forgotten, but base models could now mimic Mach 1 via an optional Decor Group ($51) and, for the first time, a twin-scoop hood. Two-tone hood paint in matte-finish black or silver was again sold separately ($35). A functional ram-air hood remained optional with the two-barrel 351 only (at $58). Steel-belted radial tires joined the options list, where snazzy polished aluminum wheels ($111-$142) replaced the familiar styled-steel Magnum 500s. Fastbacks now offered an optional vinyl covering for the front three-quarters of the roof ($52). The Mach 1 got a revised honeycomb grille texture and new lower-body striping. The uptown Grande hardtop now included a useful parking-brake warning light. 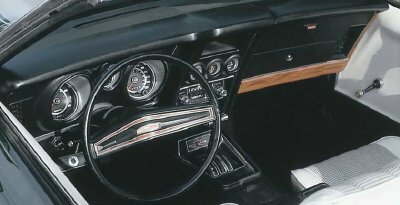 As it had since '71, the Grande came with a "halo" vinyl roof, so-called because the covering left a slim band of body color around the side windows. To meet new limits on oxides of nitrogen (NOx), all 1973 Ford Mustang engines got a revamped emissions-control system with positive crankcase ventilation and exhaust-gas recirculation. The EGR routed gases from the exhaust manifold through a vacuum valve into the carburetor to be diluted by the incoming fuel/air mixture. This permitted leaner carburetor settings but also diminished horsepower except on the 302 V-8 and 250 six. The two-barrel 351 sunk to 173 net horsepower, the four-barrel version to 259. As noted earlier, the 351 HO got the heave-ho, a victim of weak demand and too much required finagling to satisfy the federal air marshals. Equally disheartening, four-speed manual was now limited to the 4V 351, and automatic was mandatory with the two-barrel unit (though most buyers ordered that anyway). In other technical news for '73, power front-disc brakes were newly standard with either 351 V-8 and for all convertibles, and both disc and drum brakes were enlarged for cars without power assist. Interiors adopted flame-retardant materials to meet a gruesome new federal "burn rate" standard (four inches per minute), and some hardware was redesigned to be less injurious. Prices went up a bit for '73. With six-cylinder engine the hardtop started at $2760, the fastback at $2820, the ragtop at $3102, Grande at $2946, and Mach 1 at $3088. Mach excepted, the 302 V-8 added $87.